If you’re just looking for a great looking e-newsletter template, we can set you up on our DIY plan. We will establish a custom-branded template for you (what we call your blueprint) so you don’t have to know HTML or be a design expert, yet your emails will always look professionally designed. At Mail on the Mark, every e-newsletter project starts with the development of a professionally designed, custom-branded e-newsletter blueprint. Our careful intake process will help you determine which type of content you want to include such as: articles, company news, events, coupons, case studies, samples, photos, etc. We will also need to see your current brand elements including your logo, web site, printed marketing materials, corporate color palettes or fonts (if these items are available). We build you a flexible, yet standardized format to promote your content and build your brand. Every design is mobile optimized. You will have an opportunity to review the design and layout and provide feedback before we finalize the blueprint. The approved design will then be coded to be email-compatible HTML and put into our web-based system so that it is ready to be used to send out custom-branded emails to your target list. The one-time fee for the blueprint setup is $1500. Your blueprint—combined with a customized user guide and phone-based training—makes it simple. Quickly and easily, you’ll be sending out professionally designed e-newsletters to your customers and prospects. If you can use Microsoft Word, this will be easy. Mail on the Mark is a web-based application. The editing tools are extremely user-friendly. 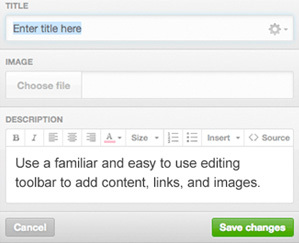 You’ll be able to add text, links, and images. You’ll choose who will receive the e-mail. You can have unlimited lists and can send or exclude based on any list. See details below for the fees for sending your emails. Mail on the Mark offers a variety of reports for you track your e-newsletter results. As soon as you start sending out your emails, you can see the reports in real time. For every email campaign you send, you’ll be able to see exactly who opened it and what they clicked on. You’ll know which links were most popular. You can also see whether any emails bounced. All past e-newsletter reports are stored, so you can compare your results, or review whether a recipient has engaged with your content previously. After your e-newsletter blueprint is ready to go, you will be charged based on the size of your email list and the total number of emails you send each month. If you have more than 50,000 names on your email list, good for you. Give us a call and we’ll give you an estimate. If you plan to send very frequent emails, you’re going to need a high volume plan. Just give us a call and we’ll provide an estimate. If you’re sending as many as one email per week you should be fine with our regular plan. Our most economical plan has no recurring monthly fees. Every newsletter you send out costs $10/campaign + $.03/email. You get charged only when you send an e-newsletter. If you send less than one per month this may be the way to go, but you cannot use autoresponders with this setup.